Dalworth Clean Rug - Food & Fun! Saturday, November 5th from 9am to 1pm. 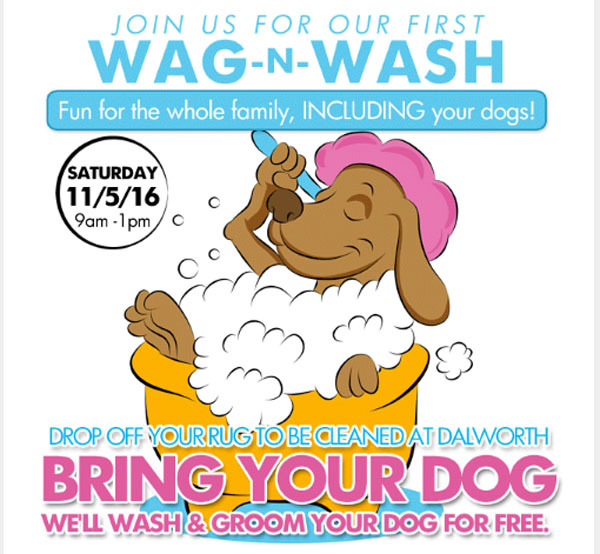 Come Join Us for our 1st Wag-n-Wash at Dalworth Rug Cleaning! Fun for the Whole Family, INCLUDING your Dog! Drop off your dirty area rugs (including orientals) at our Dalworth Rug Cleaning facility to be cleaned -or- come make a carpet cleaning appointment and while you're here, Rocky's Purr-Fect Paw's will wash your furry friend, Our Treat!!! Mobile ♣ Pet Wash ♣ Vendors ♣ Pet Adoptions ♣ Kid Zone ♣ Food and fun! Our gentle yet thorough process is sure to get pet odors out of your rug, PLUS our repair center can replace fringe and fix those corners that need some attention. Our entire process takes about 5-7 business days and when your rug is ready, we will deliver it back to your home.